The term "Nibiru" comes from the ancient Sumerian cuneiform tablets dating back 6,000 years ago. The term Nibiru means "Planet of the crossing" and it's cuneiform sign was often a cross, or various winged disc. It was considered by the Babylonians to be the celestial body associated with the god Marduk. The Sumerian culture is the first recorded civilization on earth, now today's Iraq. It has been known throughout ensuing time periods as Sumer, Mesopotamia, and Babylon, all the same location for where earth's first culture shows up on earth. The Sumerian Culture is the oldest known civilization we know of based on the artifacts and monuments that still remain. According to renowned historian, Hebrew scholar, author, speaker and archaeologist, Zecharia Sitchin believes there is an undiscovered planet that follows a long elliptical orbit that reaches the inner solar system every 3,600 years; this planet being called Nibiru. 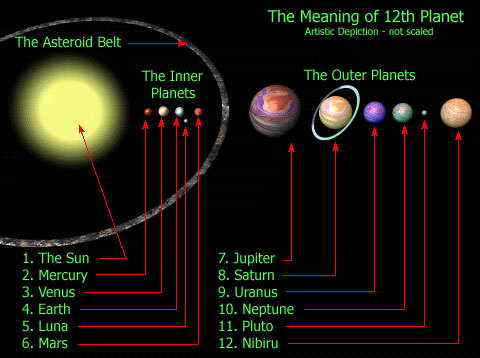 According to his theories of Sumerian cosmology, Nibiru was the twelfth member in the solar system family of planets (which includes 10 planets, the Sun, and the Moon). Its catastrophic collision with Tiamat, a planet that was between Mars and Jupiter, would have formed the planet Earth, the asteroid belt, and the Moon. This event is said to have happened 4.5 billion years ago. Sitchin claims that Nibiru was home to the technologically advanced extraterrestrial race referred to in the Bible as Nephilim (fallen angels) and called Anunnaki ("those who from heaven came to earth" in Sumerian) in Sumerian myth. He claims that the Nephilim arrived on Earth approximately 450,000 years ago to mine for minerals, specifically gold in Africa. (NASA recognizes these gold particles and uses them to plate various objects including astronaut helmet eyeshields.) Sitchin believes that the Anunnaki genetically engineered Homo sapiens as slaves to work their gold mines. The gold was needed to protect Nibiru’s diminishing atmosphere. After many failed prototypes an Anunnaki goddess engineered a perfect specimen- the Adam. This was done using 80% of the Inferior specimen and 20% of the superior Anunnaki specimen. It is only recently that we understand DNA as having a double-helix nature, The Sumerians depicted their goddess creator along with snakes in a double helix form with thin bars connecting between them in a spiral fashion. The intertwined snakes are also modern day representatives for the field of medicine. Sitchin speaks of the ancient Mayan astronomers and the predicted return date of Nibiru passing Earth during its 3,600 year cycle. This coincides with the Winter Solstice of 2012; specifically at 11.11 UT, December 21, 2012 shown in the Mayan calendar. This also coincides with a rare alignment of the Earth, Sun and centre of the Milky Way, and is considered to be a likely cause of Earths pole shift. Modern astronomers don’t agree with all of Sitchin’s interpretations of the Sumerian writings. They believe the translations are incorrect. However, they do entertain the idea that there was a giant impact theory of the Moons formation about 4.5 billion years ago of a collision that impacted the newly formed Earth. Astronomers dating back to 1840 up through 1980 have studied why there seems to be a heavy pull on the outer planets of Uranus and Neptune as well as some asteroids. They believe that there must be a larger planet causing this pull. It was consequently named Planet X by Astronomer Percival Lowell. Modern day astronomers believe that Planet X is a massive ball of dust and gas that almost succeeded in becoming a star. It has something no other planet has, a 3,600 year orbit cycle around the sun. When it returns to the solar system, it accelerates and swings close to the Sun disrupting everything it encounters. It triggers earthquakes, volcano activation, and massive tsunamis. It can also cause the Earth’s axis to flip over pushing Africa to the pole and Antarctica to the equator.